Time to continue my detailed discussion of Knights of the Fallen Empire's individual chapters! 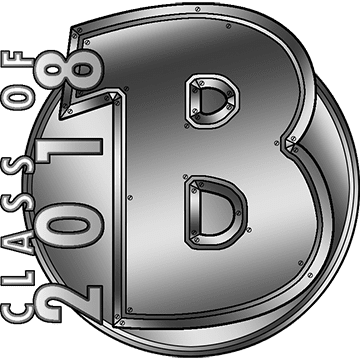 Unsurprisingly, this post will contain spoilers for the chapter in the title and may contain spoilers for previous chapters as well. 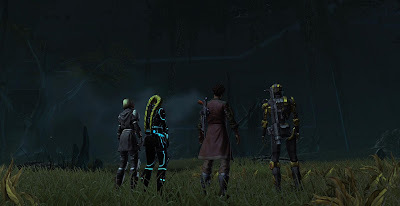 At the end of the last chapter, you and your new companions (Lana, Koth and HK-55) barely escaped Vaylin's clutches, but your escape vehicle was damaged in the process. As night falls, you find yourself forced to crash-land in a nearby swamp, dubbed the Eternal Swamp by the locals (according to Koth). Nobody is hurt by the crash and people are in relatively good spirits, with Lana and Koth immediately falling into more banter, indicating a long history between the two. HK-55's scanners indicate a large metallic technological object nearby which seems your best bet at escaping the swamp, considering that the crashed shuttle is a complete pile of scrap. You set out to investigate with HK while Koth and Lana stay behind to cover up the evidence of your landing. While investigating the swamp, you emerge into the first public area of KotFE... which was actually a bit of a shock to the system for me initially, because upon seeing another player I realised that I had spent the last three chapters without this ever happening, completely secluded in my personal instances the entire time. There's also a bonus mission to kill some wildlife if you fancy. I found it a bit disappointing that all the animals are reused models from other planets, which doesn't make Zakuul's wildlife look particularly interesting. There's also a chance of running into more random skytroopers, which really makes you wonder how these things operate, seeing how they seem to get sent out in small groups to scout, yet it never seems to alert anyone when one suddenly disappears and never reports back. Finally you run into a new monster type called iknayid, probably more commonly referred to as "ugly spider things", and find various pieces of scrap metal that appear to be part of something bigger. As you make small talk with HK, he reveals that he's been programmed to be just as loyal to you as to Lana or Koth and to prioritise your survival above all else. You can humbly tell him that you're not that important or abuse your position by asking him to alter his programming further to obey you above Lana or Koth if it comes down to it. Eventually you find the object that HK's sensors had been picking up and it turns out to be the wreck of an ancient starship. According to HK's scans it's centuries old and doesn't match any known Zakuulan designs. Koth gets quite excited about this and concludes after a brief inspection that you've found the legendary Gravestone, the only known ship that went up against the Eternal Fleet and won. 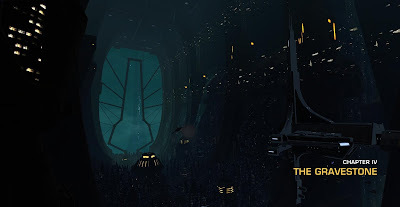 It's also revealed that the Eternal Fleet is actually older than Valkorion and possibly even Zakuul, so the details of how the Gravestone faced off against it are lost to history. Koth is convinced that you finding this ship - one that others have supposedly been looking for for ages already - is a sign of destiny, that you are meant to win this conflict. You clear part of the ship of more wildlife with Koth by your side, while Lana and HK do the same to other sections of it. At this point we get another glimpse of the Eternal Throne, showing that Arcann and Vaylin suspect that your team must have landed in the swamp and intend to search it. A Zakuulan Knight reports to Vaylin and submits himself to her judgement since he was the one who was supposed to oversee the security of the carbonite prison. Vaylin draws her lightsaber and stabs him without a second thought. It's interesting that Arcann actually seems a bit taken aback by this. Aboard the Gravestone, you get more backstory about it from Lana and Koth. Koth has determined that the ship was intentionally scuttled after the defeat of the fleet, and clearly didn't crash. It's revealed that the Eternal Fleet is fully automated and was reactivated by Valkorion. Arcann can actually fully control it from his throne. Also, the gravestone has a mailbox. I loved that after three chapters of relentless movement, the first chance to check your mail comes inside of a centuries-old crashed starship. Logic! Your companions suggest that you need to look for fresh water and supplies as well as scavenge for spare parts to repair the ship. You can choose which one you want to do first, look for water with Lana or go scrounging with Koth. I haven't noticed the order making any sort of difference to the actual conversations you have with them. Either way it is... exposition time! While searching for water with Lana she gets you caught up on the state of the galaxy. Apparently everyone knows by now that Valkorion was the Sith Emperor, since his death sent massive ripples through the Force. Arcann invaded both Republic and Empire soon after, framing it as revenge for an Outlander killing his father. The technical superiority of his ships was such that neither faction could compete and both were outmatched within three months or so, so that both eventually surrendered/negotiated a ceasefire. Most members of the Dark Council have died or disappeared, with Darth Acina (of the Imperial Seeker droid quest line) having declared herself Empress. On Republic side, Saresh has officially been replaced as Supreme Chancellor but apparently still wields all the power behind the scenes. Both factions have to pay heavy tributes to Zakuul, but instead of teaming up against their common foe, they still try to snipe each other while they perceive the other to be weak. Lana also says that she has allies looking for your old ship and crew but that it might take time to find them. She considers you an important piece in her plan to restore some kind of order to the galaxy. Also... she suspects that something is different about you since the carbonite prison - you can confess that you've had Valkorion talking to you in your head or deny that anything has changed. While out searching for parts with Koth he tells you that he was in the Zakuulan army but deserted when he and his troops were ordered to massacre civilians during a mission in the core worlds. 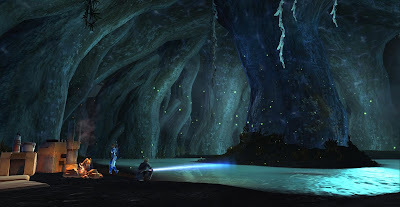 He also kind of fishes for your approval, wanting you to agree with his assessment that you finding the Gravestone was clearly fate, and wanting more reassurances that you don't plan to take down the population of Zakuul as well as Arcann (if you saved the civilians from the damaged generator in the last chapter, you already got some brownie points there). Now at some point before you return to the ship, HK calls for you to join him at his location. I can't figure out how the game decides when this happens. In all three of my playthroughs it actually happened after the dialogue with Koth, even though I mixed up the order in which I took him and Lana out into the swamp. In fact, it was only thanks to a random YouTube video that I realised that there is a chance that HK will call you while you're with Lana instead! It turns out that he's run into a bunch of space hobos exiles that were expelled from the city for protesting Arcann's rule (seems Arcann isn't quite as ruthless with his punishments as Vaylin) and isn't sure what to do with them. You can offer to take them aboard the Gravestone or tell them to get lost. (Koth approves of the former, Lana of the latter.) The extra cruel option is to tell HK to shoot them once your other companion is out of earshot. As you set out to repair the ship in earnest, you're shown what's quickly become known as "the eighties montage", which has Koth putting some cantina music on while he tries with mixed success to get the Gravestone up and running again. Meanwhile Lana uses the Force to tidy up and HK gets into a private little war with the iknayids outside, which makes for some hilarious viewing. When the Gravestone is powered up again, you hear some strange sounds. 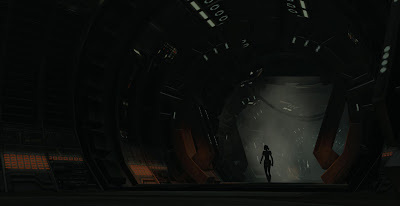 You follow them to investigate the part of the ship where they seem to orginate and find a "Dark Sanctuary" in the bowels of the ship where Valkorion's ghost appears to already be waiting for you. I remember reading the title of this chapter on the original KotFE preview page and wondering who dies. So deliciously misleading! You can definitely start to detect a pattern here in terms of how the chapters play out. Chapter one was all action, chapter two contemplation. Chapter three was very focused on action again, now chapter four offers another chance for contemplation. "The Gravestone" is probably one of my favourite chapters released so far. The Eternal Swamp at night is hauntingly beautiful if you actually take the time to look at it, especially with the impossibly large city looming in the distance. And of course you finally get some answers about what's been going on. They are only morsels of information really, but for me personally they definitely whet my appetite for returning to the Republic or Empire and seeing how they've changed. A lot of small comments are made in this chapter that become relevant somewhere else later. 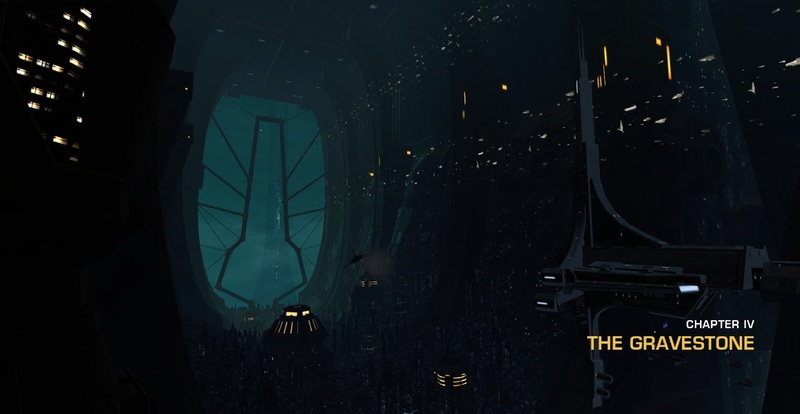 For example it's mentioned that Zakuul has built powerful battle stations over several planets - these are the Star Fortresses you get to destroy later. There's also Koth harping on about fate, which will be shown to be a concept important to other Zakuulans as well. I wouldn't be surprised if even more things that get talked about here will turn out to be important in the upcoming chapters. Of course the notion of getting a thousand-year-old starship back up and running within a few hours is patently ridiculous, but hey, this is Star Wars. It's never been too big on this kind of thing being anywhere close to "realistic". The 80s Montage only works if you've got 80's music. They should have borrowed some stuff from either Real Genius or Weird Science, as either would have fit. Would you have expected any less from a teen of the 80s? I dunno, I thought the cantina music worked fine. Real 80s music would have felt a bit fourth-wall breaking (and probably would've required some annoying licensing).